After you've placed your first order it's even easier to place your next. No more battles with traffic or scuffles for that elusive carpark. No more waiting in queues. No more wrestling with heavy, awkward bags in and out of the car. No more counter frustration when you're told "Sorry we haven't got that in stock". No more dealing with poorly trained staff that know less about the product than you do. No more special trips for food & Vet treatments you simply forgot to add to the list. Let your pet needs become our responsibility ... its that simple; place your order here and we do the rest. We know you're busy and we appreciate that shopping for your pet’s needs, particularly food, is awkward and inconvenient. With so much on your mind you often simply forget to add their requirements to your shopping list. Or someone forgets to tell you "Mum we're out of dog food". Now you can relax. Let us take care of this important chore for you. 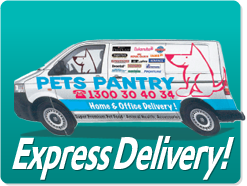 We’ve been doing it in Australia since 1996 and have thousands of satisfied customers regularly using our secure online pet store and delivery service. And after your first experience with us it’s even quicker & easier to reorder. Just click on the yellow Quick Reorder button above & you’re done. It’s that simple ! We’re so convinced that once you've experienced the convenience of our online pet store, home delivery service & the quality products we recommend (particularly our Super Premium pet foods), you’ll never buy your pet supplies any other way ! And, what's more we back it up with a Money Back Guarantee* ! So what are you waiting for; get to it and place your order now ! Yes, I’ve heard about Super Premium Pet Foods but what exactly are they & why should I feed them ? Nutrition, or what you feed your pet, is the most important component of how your pet functions and feels. Super Premiums represent Superior Nutrition. They are complete & balanced dry foods which use high quality meats, not cereal, as their primary source of protein. They are nutrient dense, highly digestible and palatable ensuring your pet receives the correct balance for the maximum nutritional benefit. In addition they are supplemented with high quality natural combinations of fats, carbohydrate, vitamins, minerals, probiotics, prebiotics and digestive enzymes. They contain no artificial colours and flavours and are naturally preserved. If you feed a Super Premium rest assured that you’re feeding the best possible food available. The Super Alternative to Supermarket Pet Food. Most pet owners feed supermarket brands in the mistaken belief that they are adequately caring for their pet. THEY'RE NOT. Unfortunately supermarket brands are almost always cereal based, and contain only a small amount of meat which is primarily offal and meat by-product not meat muscle. Protein levels are about half that of Super Premiums. Digestibilty is around 20% compared to Super Premiums which deliver 80% plus. So you need to feed more so your pet can reach an adequate level of nutrition. It also means that more than 80% of what your pet eats ends up in your backyard or the litter tray. They’re less palatable and most contain artificial colours, flavours and preservatives. Most are incomplete diets. Furthermore, manufacturers of these supermarket brands prefer to pour millions of dollars into expensive advertising (sprouting dubious claims), rather than on what really matters; improving the quality of their products ! Here at Pets Pantry we ONLY stock Super Premium brands. So rest assured you can rely on any of the products you choose from our website. They have surpassed our strict selection criteria. They are BOTH complete & balanced diets which meet the highest level of quality attainable in pet nutrition. Furthermore we’re so convinced that they are the ONLY products you should consider for your pet, we back them with a Money Back Guarantee*. Here’s 7 Reasons why you should ONLY ever consider feeding Super Premium Pet Food. Super Premiums maintain your pet in peak health, and a healthy pet means a happier life with fewer and less expensive vet bills. Pets who consume Super Premiums throughout their life, live LONGER - It’s a proven fact. Super Premiums firm up and dramatically reduce the smell and quantity of droppings, making backyard clean ups easy with much less to pick up. In fact up to 80% LESS POO than supermarket brands. They’re Highly Nutritious and Super Tasty - Pets in taste tests consistently prefer them over supermarket brands. They keep your pet’s teeth and gums clean and healthy - so LESS cavities, gum disease and “ doggy breath “ to contend with. They’re surprisingly cheap to feed. Yes, they appear expensive to buy, but don't be put off by the bag price. What’s important is how much they cost to feed. We’re talking about concentrated nutrition that on a cost per feed basis is MUCH CHEAPER to feed than any home made or canned diet and not much more expensive than supermarket dry food. They promote a lush, shiny coat which is easy to groom & keep clean. You’ll be the envy of pet owners in your street. So don't be surprised when people come up and ask "You’re pet looks absolutely fantastic, what are you feeding it ?" Your pet deserves to eat Highly Nutritious, High Quality food too !